Dock Ellis got sober in 1980, the year after his notable major league career came to an end. From what I can gather, he spent his remaining years helping others. In fact he had already begun reaching out to help others during his career, often going into prisons to talk to inmates, where he learned not only that he could get through to people in difficult situations but that it was for him something of a calling. Dock always had the guts to do what he wanted to do. During his years as a high profile major league star, this kind of bravery made him an outspoken, polarizing character, vilified by some but honored by others, including Jackie Robinson, who near the end of his own life personally reached out to Ellis to encourage him to continue taking stands when he saw fit. Check out Jay Jaffe’s Futility Infielder for an excellent retrospective of Ellis’ career. Be sure to follow the link Jaffe provides for a great rock song inspired by Ellis. Click on this link to hear audio (below a slide show) of Ellis describing the no-hitter he pitched while on acid. At the end of the audio there is the actual radio call of the final out. Visit the Griddle’s post on Ellis’ passing (this is where I learned the sad news) to read a story by commenter Eric Enders about a friendly and memorable meeting with Dock Ellis at the site of old Forbes Field. 1. That video shows Ellis wearing one of those really cool flocked helmets that the Pirates had back in 1971. I think they were the last team in the majors to use them. 2. Ellis’s coaches (as I recall reading) did not believe his story about pitching on acid and never do I. Dock was was a convert to sobriety and converts are always the biggest fanatics. I think he made it up to have a better story, the same way Deion Sanders said God didn’t let his car crash off a cliff when he found God. BTW, here’s a link to a great rock/country/folk song about Dock Ellis (to my knowledge this is the only song that mentions Danny Murtough) by a guy named Todd Snider. 3. 2 : I respectfully disagree about Dock making that story up about what he had been doing prior to the no-hitter. In the book Hall wrote with Ellis, Hall explains that Ellis first told him the story back in the mid-1970s when they were writing the original version of the book and that they changed mentions of acid to a vaguer story about drinking a lot the night before. (Dock didn’t want the story coming out while he was still playing.) I don’t see why Dock would make up a story that he wasn’t even planning to share. The real story came out with Hall’s updated version of the book in ’89. Just to reiterate, it wasn’t something that Ellis embroidered on top of a story already told, but rather an uncensored version of the story. That’s according to Hall. I doubt Hall would lie. Why would he? Also, the doubt people have about the story stems from a belief that such a thing could never be done on acid. I played a fair amount of sports, mostly basketball, while under the influence of that substance, and I can tell you that it’s possible to let your body do what it knows how to do while you’re tripping. If he’d said he’d pitched a no-hitter while plastered on vodka shots, I’d be skeptical. But acid? It does nothing to hamper your coordination, and like I said it may even let you get out of your own way. 4. 2 : And thanks for the link to that song! 6. 3 In regard to tripping and being in tune, I agree. The absolute best surfing I have ever done has been on a trip. The one negative thing about it was an intense awareness of the ocean being a natural habitat brought on by dolphins swimming by. I realized I could easily be eaten. Dock Ellis was a remarkable human being and it is too bad that there are very few guys who are as interesting playing anymore. It seems the large salaries have made it so guys are more reserved about things. 7. I thought that I heard of the acid no hitter before 1989. When I was younger I used to have a clearer picture of what happened which year. Now they all blend together. 8. 7 : You’re probably right; maybe the story did seep out before the updated edition of “Dock Ellis in the Country of Baseball” came out in ’89. Maybe that updated edition’s explanation of the handling of the story in the original version of the book served as the “official” debut of the story. But who knows? The years all blend together for me, too. 9. Ellis first publicly admitted to throwing a no-hitter while on LSD in an interview with a Pittsburgh newspaper (the Press) in April of 1984. 12. 6 , dolphins eat people? 13. Is it just me, or does it really not look in that film clip as though Reggie hit the ball that hard? 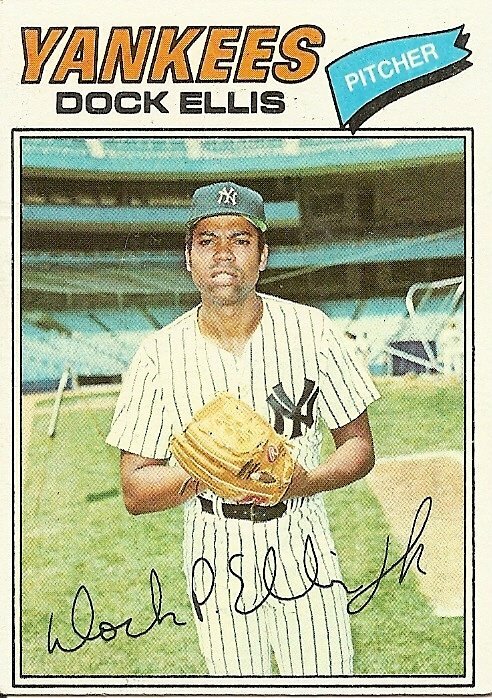 I totally believe Dock Ellis’ contention that he was tripping on acid when he tossed the no-hitter. I should know that such achievements are possible because I once fired a one-hitter after smoking fried banana peels. If that wasn’t challenging enough, I was also more than a little impaired by the leather fringe vest, love beads, and 12 ounce ankh I wore underneath my jersey. Unfortunately, I also walked 6 batters and plunked 2 others in my inning and a third.